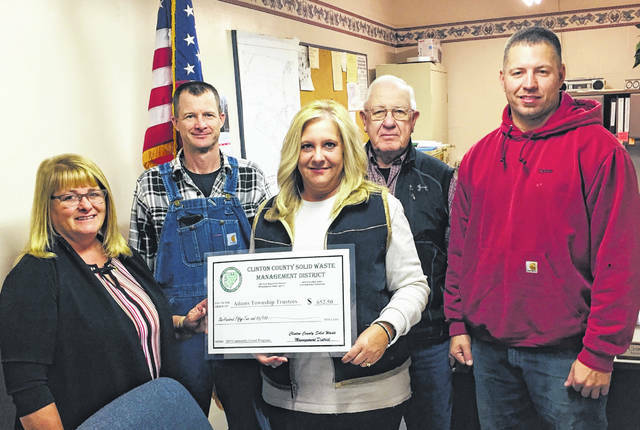 Clinton County Commissioners President Brenda Woods and Solid Waste District Coordinator Jeff Walls presented the Adams Township Trustees with a 2019 Community Grant at Monday morning’s township meeting. Pictured from left are Woods, Township Trustee Chris Collett, Fiscal Officer Melinda Rose, Trustee James Reveal and Trustee Tyler Webb. The Adams Township Trustees, in partnership with the Clinton County Solid Waste Management District, will be hosting a community cleanup for township residents beginning in April. Roll-off dumpsters will be placed behind the Adams Twp. Gym, located at 389 S. Beechgrove Road, for Adams Township households to dispose of bulky items not typically accepted by residential waste haulers. The township trustees want to remind residents that tires, paint and other household hazardous wastes are not accepted.